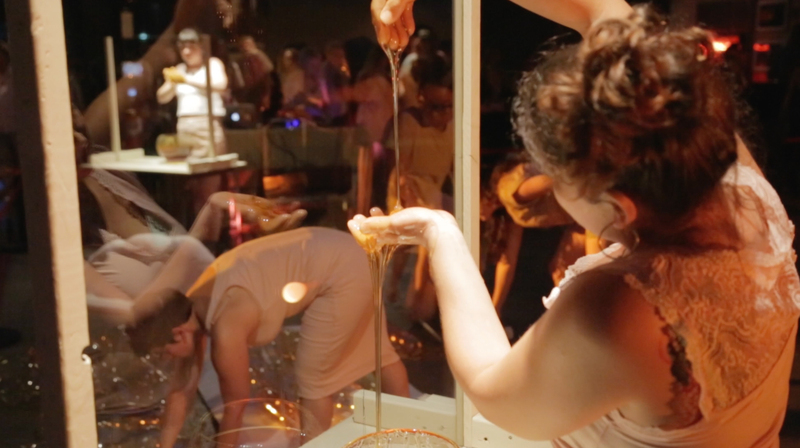 Join UrbanGlass and Suzanne Peck for a delightfully tactile performance, Half A Bubble Off Plumb, an examination of molten glass in context with rhyming materials like honey, soap bubbles, and cotton candy. Peck’s fascination with glass is fraught with desire to master the substance while molten – at its most inspiring but untouchable state. Through parallel materials she is at last able to dig into something “glasslike,” all while peeling back the secrets of each individual medium. This 45-minute performance will be accompanied by live vocals and soundscape by Kelsie McNair. Suzanne Peck is a visual artist, writer, curator and educator. She earned her MFA from the Rhode Island School of Design’s glass department. Indeed, glass provides continued inspiration in her work, even when the substance itself is absent (isn’t glass always, in a way, absent?). Using glass, photography, digital video and new media, her art practice considers touch, interconnectivity and skin through the lens of sculpture and installation. Her work is exhibited worldwide and held in both public and private collections. Suzanne teaches and exhibits across the United States and Australia. Suzanne Peck is a visual artist, writer, educator and curator living in New York City. Her work considers themes of skin, touch, intimacy, and material, with a healthy scoop of irreverence on top.